(Newser) – The 18-year-old woman killed when a car slammed into Times Square crowds Thursday in New York has been identified as Alyssa Elsman, the New York Post reports. Elsman, a Michigan native, was visiting New York with her family. According to the Detroit Free Press, Elsman graduated from Portage Central High School in 2016. Principal Eric Alburtus remembers her as a "wonderful young lady" who used to sell the muffins she made in cooking class to other students. "We're all kind of a mess," he says. Elsman's 13-year-old sister was one of the 22 people injured when a car sped along the sidewalk for three and a half blocks. I guess I was paranoid already for being there and it was late at night. I did my hotel booking in Philly as it was way cheaper. I then picked up a car in New Brunswick and parked it at Rutgers. I then took the NJT train to Penn station. I was only there from about 5pm to 2am on the evening I visited. My other visits were in the day. I made my way to Times Square and noticed that they had shut down a lot of the streets with those big plastic barricades. People were renting those cheap woven lounger seats so you could sit out on the middle of Broadway and just take in things. I found the Broadway NYPD station and talked briefly. Its funny I took one of my radios out that had both ham and agency frequencies and NYPD Manhattan dispatch uses the same frequency as our county fire. Of course its on different inputs and tones. I visited my uncle's precinct station where they filmed some of Serpico. The 9th precinct was called the Hollywood unit because if any director wanted NYPD in their film, they always came from that station. It was a fun visit and I recently learned they are going to kick out Madison Square Gardens so they can rebuild Penn Station to like it was before they demolished it for the gardens. On my evening visit, I made the drunk train back to Rutgers. Saw NJTP kick off some drunk prostitutes. One of them yelled "Why did you dump me here with no cab fare..." as the train pulls away. 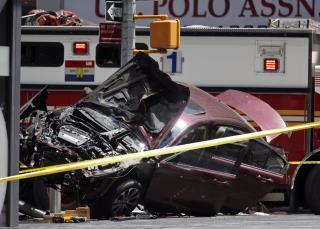 To the family of Alyssa Elsman - as a NYer and a Bronxite, I am so very sorry for what happened. As for the unidentified substance Rojas had taken - I wouldn't be surprised if it was K2.